Yes, I have been knitting! 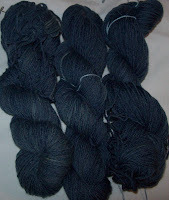 Look at my lovely indigo blue sock yarn! Kelly (aka LICraftGal- who is sporting a cute curly new do) dyed it for me. My queue of socks to knit (we’ll just pretend I don’t already own dozens and dozens of pairs) is growing faster than I am knitting. --I want some black/white/grey ones (cause being a NYer, black is a staple of my wardrobe)—and I don’t much like knitting solid black. --I want some more blue ones (indigo, and other blues)—to match my denims. --Last year, I got some lovely purple Kroy yarn (from Robyn who was destashing) and my February Lady sweater is purple (and I have a good deal of purple in my wardrobe… (I like purple! )—so I need some purple socks. So where am I with the current sock on needles? Subway socks have gussets and then some. I am into plain knitting now. The pattern is interesting, but it has a definite bias. Just look at this image! I’ve decided on a pattern for my Angora Bamboo gauntlets. I vaguely wanted a cable of some sort, since the soft yarn needs a pattern to buck it up. I had an idea, and then saw exactly want I wanted on Zippiknits blog—in her Socktober socks. (Now find the stitch pattern –I am sure I have it somewhere in some stitch dictionary.) Done! And unfaithful friend that I am, I have ignored the almost done Teal shrug to start and work on an Almost February Lady. Almost because I’ve made so many modifications, it’s really just a similar top down raglan, rather than a proper February Lady. I went with a Tubular cast on (in purl)—it’s stretchy –but to a limit. Enough to look good—but not enough to get to stretched out. 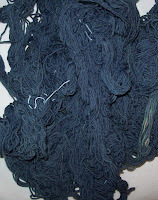 Then the yarn—hand painted –beautiful as they are—are mostly out of my budget—and while I could have overdyed some pastel yarn and gotten a semi solid in a darker color-(something I have frequently done for sock yarn) I wasn’t interested in doing that for all the skeins I would need for a sweater. So I decided on a striped yoke—Alternating Peach (the color way name is water chestnut—but I’ve never seen a water chestnut this shade—it is the soft peach of pickled ginger) and Dark Salmon—(the color way is labeled Current) but when I grew red currents they were never this color! The bulk of the sweater (the lace) will be in the lighter peach tone. A final refinement is the inclusion of short rows in the back-without short rows or other shaping—sweaters like this ‘self adjust’ with wearing--the back rides up and the front sags. Peach (well orange) is compliment to blue—and I like the excitement that high contrast offers. (and back to where I started, I’ll need some socks to coordinate with this sweater, won’t I? Paton (the sweater is being knit in Patons Classic Merino wool) has a lovely copper colorway in the Fx sock yarn—So that’s one more pair of socks to knit! I am 4 rows (2 stripes) 2 rows/1 stripe away from separating the sleeves from the yoke and working the body. The rows are long now—but striping helps make them interesting. Love the indigo! I'm not usually a big fan of blue, but indigo is the exception.